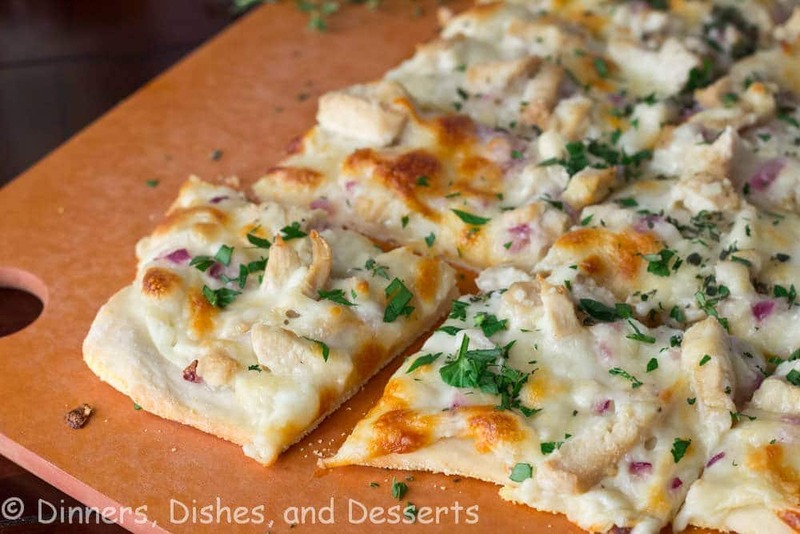 Roasted Garlic, Chicken & Herb White Pizza – Roasted garlic sauce topped with chicken, red onions, and herbs. 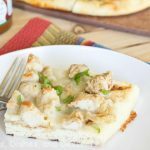 A great white chicken pizza that will rival any pizza out there! The name of this pizza is kind of a mouthful, but I just didn’t want to leave anything out. I call it Roasted Garlic White Chicken Pizza for short. It isn’t just your average white pizza sauce, so it needs to be noted that it uses roasted garlic! That is what makes it over the top after all. I don’t think I use enough roasted garlic in my life. I put garlic in pretty much everything! 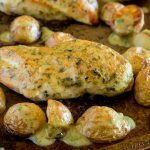 Garlic Baked Chicken is perfect if you are a garlic lover! Often times white pizza is over the top heavy with calories and fat. 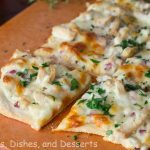 This white pizza recipe uses skim milk and a little half and half to make it super creamy, but not something you have to feel guilty about. 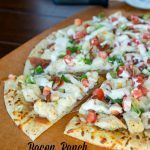 Save the Best Pan Pizza for your splurge night for sure! 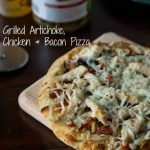 And trust me, this roasted garlic white chicken pizza tastes incredible. I brought this to cooking club a few weeks ago, and everyone loved it. They requested I bring some kind of pizza every month. Apparently between this and the potato pizza, I have made an impression. To make this pizza a little healthier I also cut down on the cheese by quite a bit. You don’t want to cover up the flavor of the roasted garlic, so you only need a little. And those fresh herbs give it lots of flavor without any guilt. Serve this with a side salad, or this antipasto salad and you have a healthy and delicious dinner. This white pizza sauce is one of our favorite sauces. We often use it over ravioli for dinner. And it is great in this Ham and Mushroom pizza as well! If it was acceptable to just drink this sauce, I probably would. It is so good! Rolling Pin: I love my wooden rolling pin. I actually bought one like this years ago and love it. This is not something I would go really cheap on because it will end up being hard to use. Pizza Cutter – whether you are making homemade pizza, frozen pizza, or even just getting take out; a heavy duty, good quality pizza cutter is a must in every kitchen. Sounds delicious, and definitely a lighter way to get your pizza fix! Ok, I know this is the light version but I went all the way with the milk and use all half and half and I used the whole bulb of roasted garlic. OMG it was very very good. Had lots of flavor. My kids added bbq sauce. I thought it took away from the garlic flavor but was tasty. Yes, yes and yes. This looks SO good and so “not” skinny, thought I can see clearly it is, which makes it better!! Those roasted garlics sound amazing as a topping! It looks so not skinny, yet it is. Wonderful recipe! When I could eat regular pizza this was always my choice! I love the combination of flavors and your recipe sounds amazing. I will print the recipe and use it on a gluten free crust next time I make pizza for the family. I can not wait to try this beautiful pizza! Absolutely gorgeous photography! This looks fabulous, Erin! I love white pizza. In fact, I think I just decided what we are having for dinner tonight! I prefer white pizza over the regular kind with the red sauce. Herbs on it are so good too. Oh, and then there is the glorious roasted garlic. Yum! I love white pizza so much! This garlic and chicken version sounds awesome! Sometimes you just NEED pizza. Yours looks amazing! I love white pizza. Plus how can you lose with garlic and chicken? I believe in the moderation rule also. No need in depriving oneself of good food – just eat sensibly, right? This pizza looks absolutely fantastic! 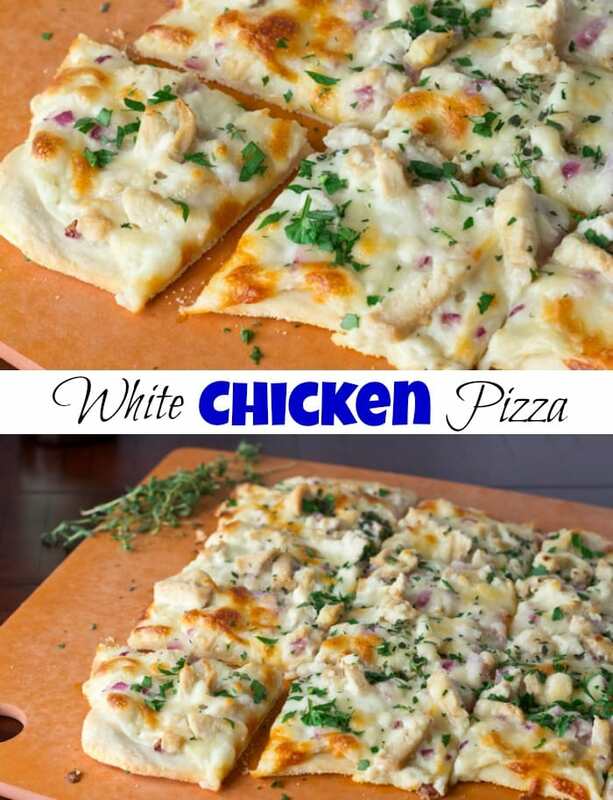 White pizza is a personal preference of mine over red, although both are good… hehehe! Your pizza looks delectable! 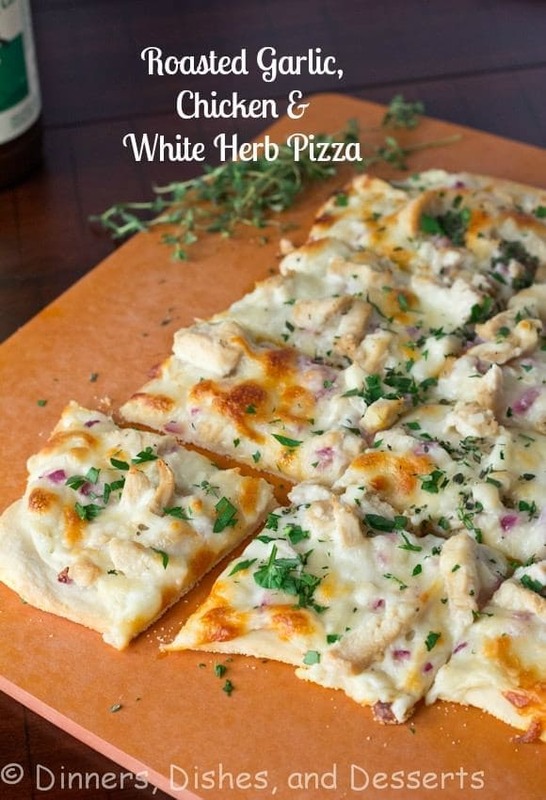 I haven’t had a white pizza in a long time…you have me craving one! 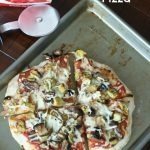 Your “skinny” pizza is calling my name – love these toppings! This is my kind of pizza! LOVE all the ingredients. My husband insists on red sauce for his pizza but this is right up my alley. It looks delicious. I can’t stop looking at your gorgeous looking health smart pizza! I wish a piece could pop out of my screen, at least to satisfy my endless craving right now. Pretty neat, thank you! Ooh I’m really craving for a generous bite of this pizza right now 🙂 I love roasted garlic and love your sauce too!! Yumm…. Love pizzas with white sauce! And all of the roasted garlic. . .yum! Can’t wait to try this! Not that healthy food isn’t amazing but this looks way too good to be skinny. 🙂 I love white pizza but I actually have never made it at home. I need to give your recipe a try, I know my whole family would love it. Oh, boy, does this look amazing!!! 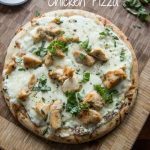 We need to break away from the plain cheese or plain pepperoni pizza and try your garlic chicken herb version! Wow! this sounds pretty decadent for a “skinny” meal. I have really wanted to make a white pizza…looks like this might be a winner! This pizza looks great!!! all of my favorite things! yum! Totally my kind of pizza. In fact, I would love this for dinner tonight but sadly we’re having leftovers. Yum! Aside from the addition of chicken (since she turned vegetarian on me) this would be my elder daughter’s ideal pizza. She’s not a fan of cooked tomato. I can’t wait to make this for her, perhaps subbing some roasted veg for the chicken! Thanks for sharing! I looooove pizza with white sauce and the amount of garlic in this is making my mouth water. This looks incredible! My eyes bugged out of my head in gluttonous amazement at your gorgeous photos. I am making this asap. I have made this before and we also like to include spinach and mushrooms! We make it on my George Foreman, 360 Grille. And I wanted to tell you that the beer that you have in one of the photos (Spotted Cow beer from Wisconsin) is one of my husband and my brothers favorites! We live in MO and my cousin bring them each a case when the come down to visit us from Wisconsin!! This looks delicious! Do you know what I could use in place of half & half? I don’t think we have that in Canada. Heavy cream, whole milk, or even skim milk with a little bit more butter would be fine! Hope you enjoy! How do you get Spotted Cow in Colorado?! I live in Madison, WI and it’s my favorite beer. I didn’t think they sold out-of-state though. They don’t. I am from WI, so when I go back I pick some up, or when our parents visit they bring me some. It is my favorite too! I’m from Wisconsin also, living in Arizona. We love Spotted Cow and thought you were from Wisconsin. Always have a good beer with good pizza. So glad you liked it Alicia! Tomatoes sound like a great topping! Can you use 3/4 c. whole milk instead of skim and half and half and still get the same outcome? Yes, that should work just fine! I just wanted to use what I had on hand, and try to make it low calorie. If you don’t care about calories you could use heavy cream 🙂 Whole milk is thik enough, I am sure it would work great! Thanks again for sharing such awesome recipes on your blog!!! Thanks for stopping by Shauna! I am so glad you liked it, and really appreciate the feedback! What is half & half? I’m from Australia so have never heard of this. Half and Half is a lower fat version of heavy cream or whole milk. You can use either in this recipe, I just used half and half to make it a little better for you. Hope you enjoy! Do you use grated parmesan in a can, or the shredded kind? You could use either, I had the stuff in a can on hand; so that is what I used. Hope you enjoy! Would it be okay to just put the herbs in the sauce as you are making it, instead of putting the herbs on top of the pizza? Sure that would work just fine! Hope you enjoy! I love how you lightened up something that can be considered a treat when watching calories – everything in moderation is the key! This has so much flavor, that I doubt the reduced amount of cheese would be missed. This looks wonderful, can’t wait to try! For the roasted garlic, did you take minced garlic and then roast it? Or buy the minced roasted garlic, the dry form? Thanks! 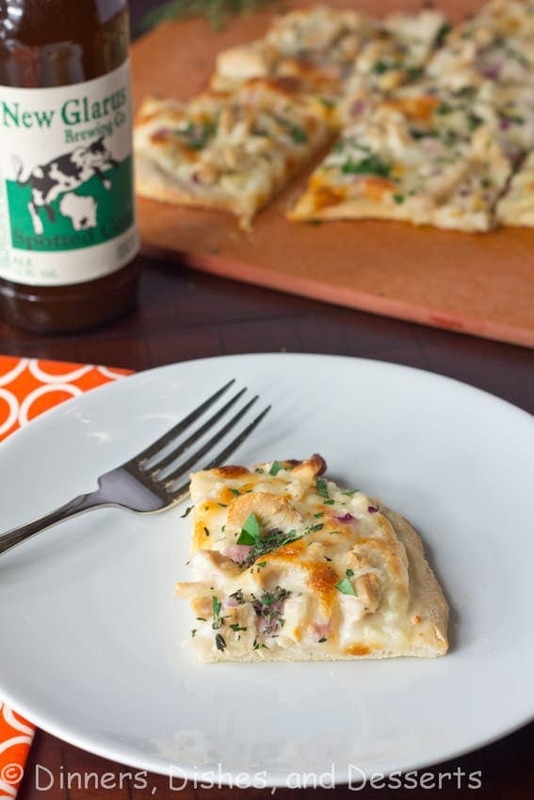 This looks so yummy but my favorite part is you paired it with the oh so delicious Spotted Cow! Yay! Another WI person who knows Spotted Cow! Thank you so much for this recipe. It is quite literally our family’s favorite! 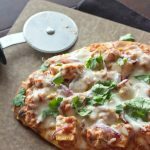 A nice variation we like to make it a little healthier is this simple pizza dough recipe I found: mix 1 cup of greek yogurt and 1 cup of flour together; knead it like dough and use that for pizza crust! That dough sounds interesting, I am going to have to try that! What a great white sauce! LOVE roasting garlic, such a wonderful flavor! Can you provide the nutritional value? Nutritional value depends on the brands of the products you use. You can click on the adapted link, to see what the original recipe was (it is a Cooking Light recipe); or go to MyFitness Pal or Social Spark to calculate based on what products you use. tomorrow i will make the pizza but i don’t know what is a half and half. can’t understand. can u explain? Shonihi in the US half and half is a mixture of milk and cream. It makes it a little less fat and calories than using all heavy cream. But whole milk, cream, or even a less fat milk will work as well. Can you make the sauce beforehand and use the next day? I wouldn’t see why not Bridgette. It might thicken a little, but you could just add a tiny bit of milk to thin it out if necessary. 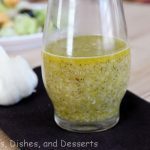 Could this sauce be made in large batches and then frozen? Would it have the same consistency? I have never tried freezing it, so I am not sure. There is enough fat, that I think it would be ok. The consistency might be a little off, but because you are putting it on a pizza and not eating straight on pasta, you might not notice. Give it a try and let me know! This recipe was out-of-this world good! We absolutely loved it. We’ve discovered a “faux” bechamel from another site that we’ve been using for the white sauce portion to save a few calories but otherwise think your idea is just perfect! Thank you! I had made a tomato garlic marinade for chicken and didn’t want to just bake it and eat with a side of veggies so I decided to shred it and put it on pizza. I used the sauce from this recipe and topped it with that chicken and some small chunks of fresh mozzarella. So good!! I didn’t realize I was supposed to roast the garlic until I was already chopping but it was still amazing without it being roasted. Would be awesome on pasta too. So glad you liked it!! We used the sauce often for ravioli – so good! I do not calculate calories, because everything varies so much with the product you use. 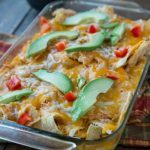 You can put everything into an online calculator to know for sure, or look at the cooking light website (I made some changes to the recipe) to get a ballpark idea. Awwww….that totally made my day! I am so glad that you loved it and mastered it! Hi, i dont hacw time to roast garlic beforehand. 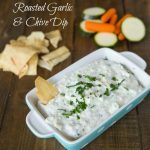 Cwn i use fresh minced garlic? Here is a recipe for roasting garlic. 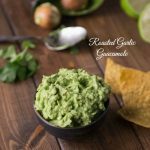 http://www.simplyrecipes.com/recipes/roasted_garlic/ I would not advice fresh garlic, the flavor is completely different. I have a question….it says 350 calories per serving but how much is considered a serving? I am dieting/counting calories so I wanted to make sure?! It is about 1/6 of the pizza. So it will depending how thin you roll it out. Wow, chicken pizza looking amazing. Very nice recipe. Il try this recipe for sure. Thank you for sharing. Yum..